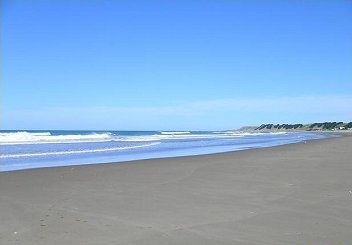 Welcome to Riversdale Beach, the largest beach resort in Wairarapa, New Zealand. The web camera takes a new photo every 10 minutes during New Zealand daylight hours. Click here for the large webcam image. Temperature graphs are also published every 10 minutes. Click here for the large temperature graphs. Riversdale Beach Resort is situated 54 kilometres east of Masterton, New Zealand travelling on one of the Wairarapa's most picturesque country scenic drives, a tar sealed road, all the way to the Pacific coast line. We invite you to come and enjoy the wonderful fun and opportunities that the Wairarapa offers New Zealanders and International Visitors.